Welcome To El Sobrante Gurdwara! - This site is powered by members of local Sikh community & and does not necessarily reflect the views Gurdwara administration. About twenty five miles north of San Francisco, El Sobrante Gurdwara Shaib is located at the hilltop of the El Sobrante Valley hills. It is serving the Sikh community in the Bay Area and given the name Sikh Center of San Francisco Bay Area. Gurdwara came into existence in 1965. Previously local Sikhs usually carried out the religious ceremonies in their homes; however, as more and more Sikhs immigrated to the Bay Area, Sikh community decided that a Sikh Temple was necessary to serve local Sikhs in terms of carrying out general ceremonies such as weddings and Akhand Path ceremonies, etc. 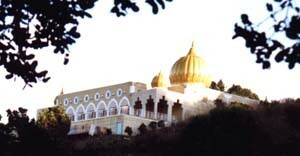 This beautiful digital image of El Sobrante Sikh Temple is owned by mygurdwara.com team. Anyone can use this image without obtaining special permission. Situated at the hilltop, its architecture and uniqueness attracts many people to come and see the site. At the northeast wing of Second floor, a huge deck offers a breath taking view of the El Sobrante valley and San Pablo Bay. I am a member of a US Civil War reenactment group. We have a new Hindu Indian member who has been telling us about Indians who served in the US Civil War, including possibly, Sikhs. I wanted to know if there was a newsletter or something where the National Civil War Association could ask if anyone over the age of 14 would like to fight in mock civil war battles in Northern California and portray one of these Indians who fought in the US Civil War. it sounds like a fascinating tale that is just not normally told. And you get the chance to fire real muskets with real black powder in uniform! I had opportunity to have darshan at gurdwara yesterday. Feeling blessed ! I would like to sent some $ to Maan Singh Kalsa can you help me? He was attacked in Richmond sept 28. I hope he does not blame Americans for this. Thank you for your comment and support. Here is a way you can help Mann Singh Khalsa. I would like to respectfully visit the temple. I was told to have a shawl to cover my head and I will need to have shoes that I can take off. What is the piper attire for women? Thank you for your interest in visiting the Sikh Temple in El Sobrante. Temple welcomes people of all faiths, colors and creeds! No membership required for visits. Here is link that has information to help your question on attire and much more information about visiting any Sikh temple in the World.